Any homeowner who has seen ants scuttle across the kitchen or a spider dangling from the ceiling knows what kind of menace that is brought about by cohabitating with pests. Pest infestations may lead to damage to your property, contaminate your house, and create an uncomfortable environment for your family. 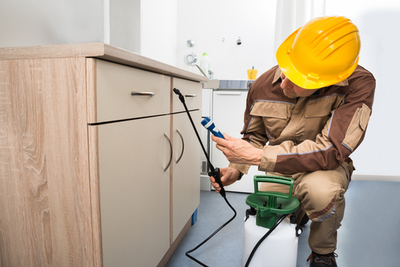 The quickest, safest, and most effective way to eliminate unwanted pests is by hiring a pest control contractor. Below are some of the reasons you should consider a professional exterminator. A professional has specialized training and knowledge about pests and pesticides. Furthermore, he is frequently enrolling for continuing education in modern and most effective methods of pest control. His sufficient training and expertise also enable him to safely and effectively administer insecticides in your residence without causing any form of disruption. Trying to administer the pesticide on your own may lead to an adverse reaction to your body. Hence, it is best leaving it to a professional. Trying to tackle pest menace on your own may consume more of your time than you may realize. To add on, your efforts may turn futile. This will lead to several attempts and more time going to waste. With a pest control contractor, more time will be saved and you can redirect that time to carry out other productive works. Apart from saving you time, a contractor will ensure that the pest problem is completely solved. When determining the costs you will incur when removing pests on your own, you will tend to consider a one-time treatment. If this does not solve your problem, more attempts will be made consequently leading to more costs. Additionally, you will interrupt your normal schedule, bring about inconveniences, and further deterioration caused by recurring pests. Identifying pests is not that easy. They are tricky to identify correctly, and if you are not well-trained to know the difference in their varied species, they become difficult to control. Different pests come in different species, and by the time you determine which one is which, you will be likely experiencing an infestation. Therefore, it is only prudent to hire a professional so as to save yourself from the headache of eradicating a large pest population. By choosing a professional in pest control, you can be assured that the pest problem is going to be solved completely. His knowledge helps him to identify where pests hide and breed, and with his specialized equipment and chemicals, he’ll ensure that all pests are eliminated and their eggs destroyed. Nothing will give you a calm mind than knowing that your premise is free from pests. You will have no worries from associated diseases, or embarrassment from a roach running across your living room in front of guests. As a homeowner, choosing a pest control contractor will be an important decision. Not only will it relieve you from the stress of eliminating pests on your own, but it will also increase your property’s value when in future you think of selling it.